Visiting the United States for the first time, for the International Writing Program in Iowa, I was pretty excited. Consequences followed soon, weird things began to happen. On the very first day, we got trapped in an elevator. On the next day Mary got stuck in the elevator. Well, I wasn’t surprised at all when, the same day, we got into the campus bus and it wouldn’t budge. When we got home, there was a fire alarm, a false one. The next evening I was playing tennis with Alan, an Australian colleague. Suddenly the lights went out and we were plunged into darkness. Soon after, the air conditioning in my room stopped working. When I went out for help, locking the door behind me, I could not get back in because the lock had somehow got jammed. In short, every technical device around me, that could possibly collapsed, broke down under the force of my enthusiastic, psychic energy. However, within a week or two I settled in and things around me came back to order. Later I went for a two-week trip to the East Coast, and when I returned, the whole chain of strange events repeated themselves. Finally, the daily routine prevailed, and only one, but constant, mysterious event disturbed it till the end of my stay. In front of our dormitory stretched a line of street lamps. Whenever I walked home at night, one particular lamp always switched off the moment I approached it and switched on when I passed. 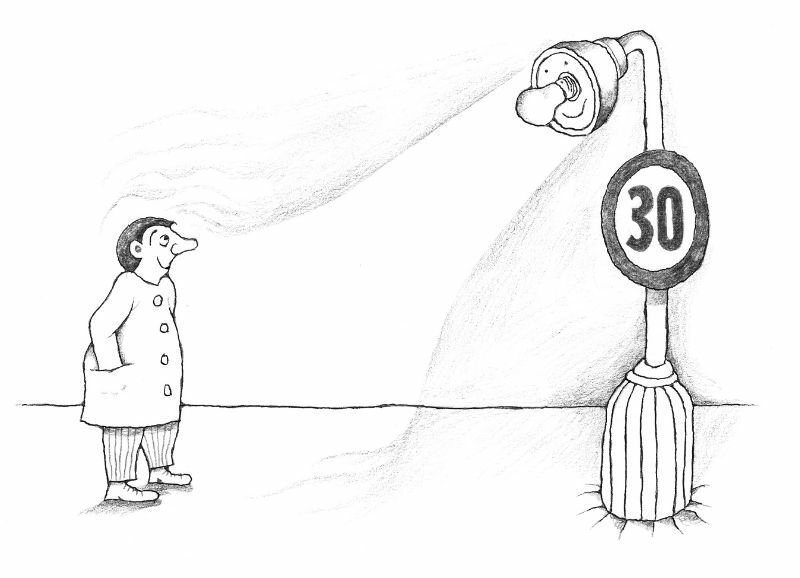 The lamp was easy to recognize because a speed limit sign was fixed to the post. Many times I forgot that the lamp was going to say good night to me and was surprised when it did. Once an American colleague gave me a ride home from a literary event, and before we came to my street I told her about this “my” lamp. Even before I had finished, I was wondering if the lamp would blink at this time. But as we approached the lamp, it switched off and we almost crashed into it. My colleague stopped the car and looked at me with new eyes. I understand that it was time to stop playing with mysteries, at least publicly. So I decided to ignore my friendly lamp, and when I came back to my home country after three months in Iowa, I almost forgot it. Seven years later I got the chance to come back to Iowa, this time as a lecturer for the same program. Again, I was very excited and full of energy. But the whole program had moved to the new university hotel closer to the center of the city. As soon as I checked in, someone from the program’s staff came to drive me to the welcoming party being hosted by the new director. On the way we were chatting about my previous stay, and I mentioned the mysterious events that had occurred way back. We had a lot of fun with it, and in a good mood pulled up in front of the director’s house. The image we saw was unforgettable. The director was standing on a chair trying to change the bulb in the porch light. That light had just failed. My guide gazed at me with a curious look in her eyes, but I jumped out of the car before she had time to say anything. I think I know what she was going to say. From a book (see in E-book form here) by Gustáv Murín: Svet je malý/The World is Small – zbierka cestovných príbehov, bilingválne slovensko – anglicky, vyd. SPN, 2012.